I lift up my boat at Granville Marina to paint the bottom this afternoon. Two of my friends help me. 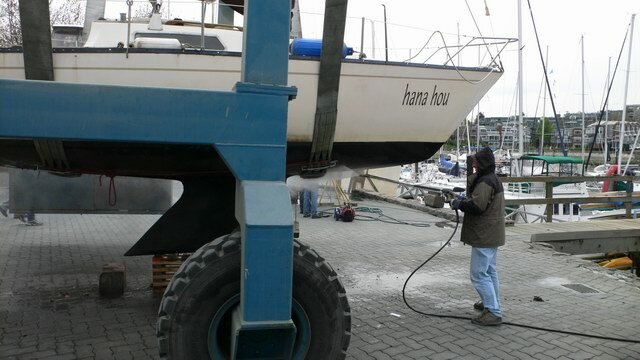 After the marina stuff lift up my boat and clean up the bottom surface with pressure water, we started repaint the bottom. At first, we scraped off the old paint roughly. This process is usually the hardest and dirtiest one because a lot of poisonous paint powder scatters. However, this time, we finished it super roughly in one hour. It is not perfect but I believe it to be enough for a half year day sailing. We used two kinds of paint; one is a so-called "precoat" and the other is "finish." Thought most owners paint precoat on the full surface of the bottom, we did it spottily, only at the pealed off spots. This process took less than one hour. We were to take a rest at a cafe near the marina, though the sky was getting dark and cold wind started blowing, which implies that a cold front is coming close, so we continued our job to paint the finish. Finish is poisonous black paint so that shells and seaweed cannot grow on it. We finished all of today's process before rain fell. All we have to do is painting the finish coat again, which is left for tomorrow.